Raaga.com: OMG! Music director AR Rahman accused for committing blasphemy against Prophet Muhammad!! OMG! 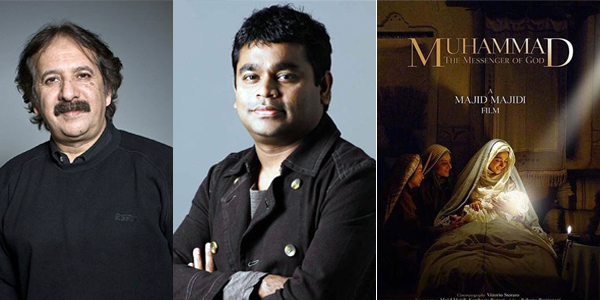 Music director AR Rahman accused for committing blasphemy against Prophet Muhammad!! The fundamentalist Muslim organization has allegedly charged both music composer AR Rahman and filmmaker Majid Majidi of committing blasphemy against Prophet Muhammad and demanded the duo to purify of their sin by reciting the sacred kalma and solemnise their marriage once again! It may be noted Raza Academy has even sent a notice to Maharashtra Chief Minister Devendra Fadnavis and Union Home Minister Rajnath Singh urging them to ban the movie in India. The organization has also raised eye brows for casting non-Muslims in the lead roles allegedly how can actors, who have dubious character in real life, play such pious characters of Islam. The Raza Academy has also sought ‘legal action’ against composer AR Rahman as he has hurt the sentiments of Indian Muslims by composing the music in the film. It may be noted that the filmmaker Majid Majidi has the honor of having been nominated for the foreign-language film Oscar Award for 1997’s “The Children of Heaven. According to reports the film Muhammad: The Messenger of God is Iran’s most expensive film to date and boosts of big names of International Cinema like lenser Vittorio Storaro and composer A.R. Rahman, as well as craft departments bristling with foreign technicians.